Chris Townsend Outdoors: Igloos, Storms, Lightning Strikes & Snow - It's Summer! Igloos, Storms, Lightning Strikes & Snow - It's Summer! The heatwave came. Glasgow was hot. I wasn’t. 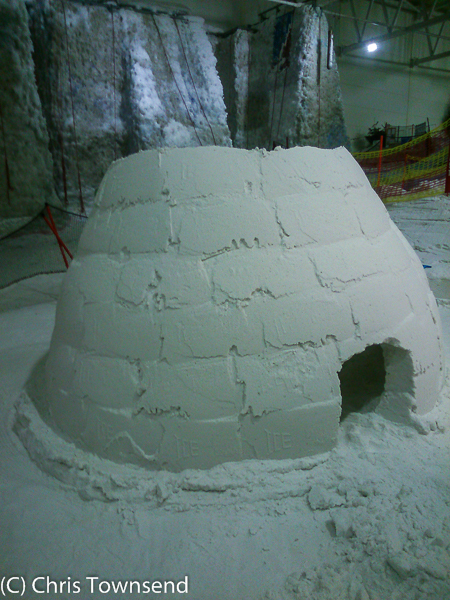 I was inside building an igloo and then watching it being filmed. On the hottest days of the year I was wearing winter mountain clothing and needing it. The first day we spent almost twelve hours working on the igloo (and discovering that artificial snow has strange properties), finally venturing out into the Glasgow night an hour before midnight. The air was warm. The city felt unreal, basking in the heat. The next day it was back into sub-zero temperatures and playing with fake snow. That evening I was on my way home, watching torrential rain lashing down as the heatwave broke. With that rain came thunder and lightning. Back home I had no phone line or internet connection. The wall socket was dead, fried by lightning. A frustrating day was spent talking to BT help people who assured me nothing was wrong with the line – ‘you must have left the phone off the hook’ was one comment (I’d disconnected the phone and the router whilst away anyway). Finally it was agreed that an engineer would come out and check the line – in a week’s time. During that week, when I did bits of work in various cafes that had wi-fi, BT sent me texts saying tests showed the line was fine and I’d have to pay if the fault was with my equipment. I knew it wasn’t. When the engineer did arrive it took him a few minutes to confirm the wall socket was blown and just a few minutes more to replace it. Back online! In between the café wi-fi sessions I headed off into the hills for sanity and escape. The plan was for a two-night trip. The weather thought otherwise. I drove across the Highlands to Glen Spean in sunshine. The hills looked wonderful. 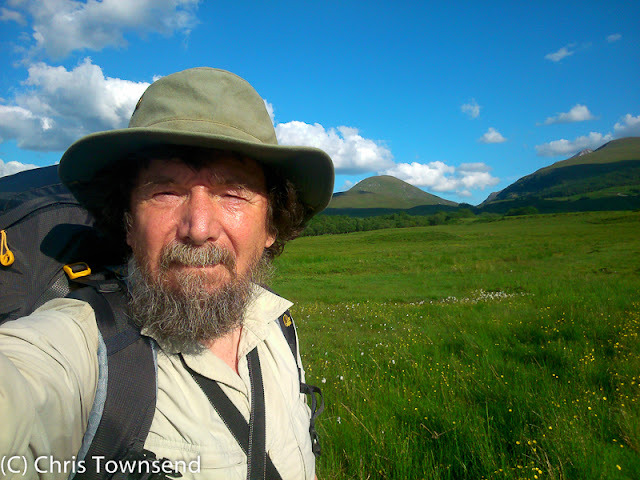 The evening was warm as I set off through flower-filled meadows into Killiechonate Forest. 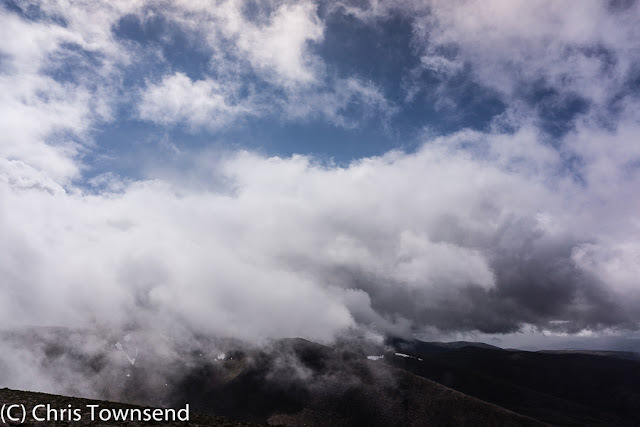 There was a gusty wind though and I knew this was meant to strengthen during the night so I intended finding a sheltered site at the forest’s edge ready for a climb onto the Grey Corries ridge the next day. The wind did indeed become stronger, much stronger. I reached the forest boundary where a hydro dam lay across the Allt Coire nan Eoin diverting much of its water into a tunnel. Above the dam the river, running free, crashed down in a series of cascades and water slides. Also above the dam the wind hammered down the open slopes. There was nowhere sheltered here. I retreated into the edge of the trees and pitched the tent beside some alders. The wind was much gentler. There was a pink sky after sunset. Maybe the next day would be sunny? The forecast said the wind would ease during the morning and any clouds would clear in the afternoon. A roar woke me before midnight, a roar of wind rushing down the glen, wind that soon shook the tent. Then there was calm. I dozed off. But soon the wind returned with another great roar. 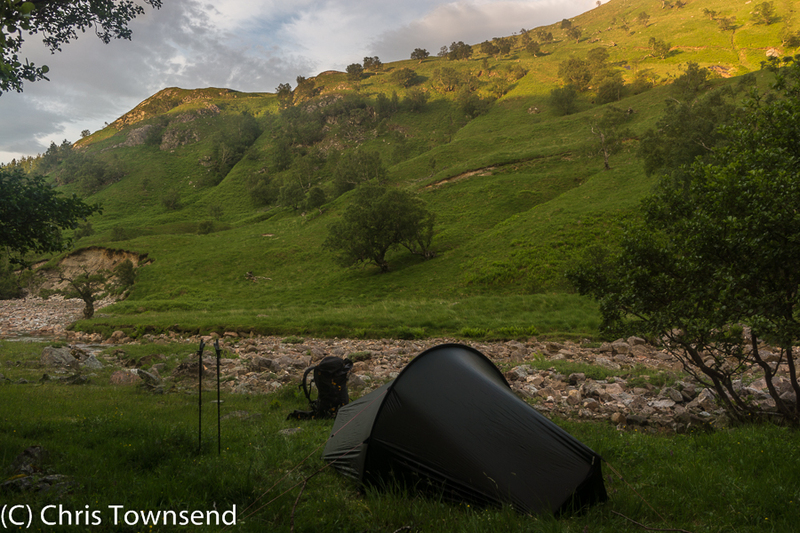 I slept on and off, woken frequently by the huge gusts and then, in the early hours, heavy rain. After finally giving up on sleep I looked out to mist drifting across the tree tops and steady rain falling. The wind roared on. For a few hours I stayed in the tent reading but eventually I felt the need for more space so I packed up and ventured out. 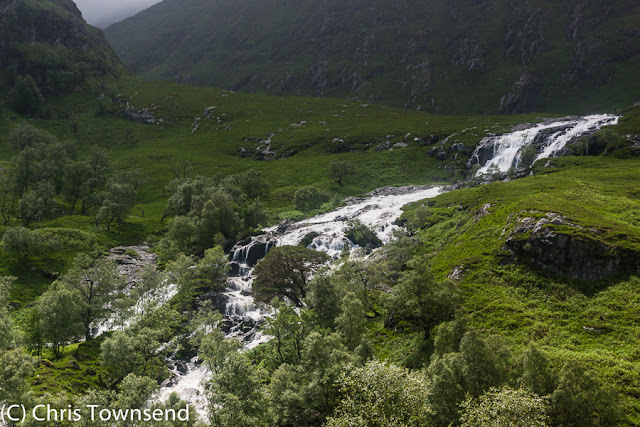 The river was spectacular as it tumbled over crags and slabs. The hills were hidden in the cloud. Above the waterfalls the battering wind and driving rain made walking difficult. There was no sign of the storm easing. Tired from the disturbed night I retreated again, this time back through the forest to my car and then to hot food and coffee in the Stronlossit Inn in Roy Bridge. The rain continued to pour and did so all the way home. A few days later the forecast was for equally stormy weather, though much colder. Much, much colder. Snow was predicted. Snow in July. I couldn’t resist. In the Cairngorms it was certainly cold. I wore hat, gloves, fleece jacket and waterproof jacket and trousers all day. 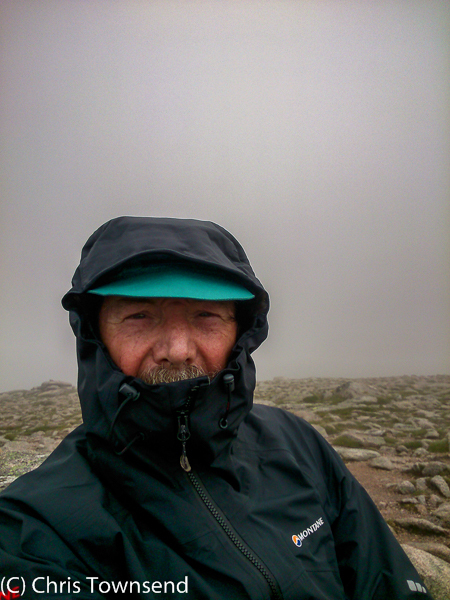 Showers of rain as I set off turned to wet mist on the summit of Cairn Gorm. The northerly wind was fierce. I wandered over to the subsidiary summit Cnap Coire na Spreidhe and sheltered behind big granite boulders. There was a hint of whiteness in the bits of wind-flung drizzle. Back on Cairn Gorm I waited to see if it would snow. The temperature was just above freezing. I sat amongst some rocks out of the full strength of the wind, watching the mist. Then a white splash hit a rock followed by another and another. Big wet snowflakes were falling. They touched the stones, lingered for a fraction of a second and then were gone. But it was snow.